Matthew Apgar - mapgar@shawmedia.com Aileen Escobar of Chicago, 14, left, rolls a large tube down its track during the Autumn Drive event on Saturday, Oct. 17, 2015 at All Seasons Apple Orchard in Marengo. 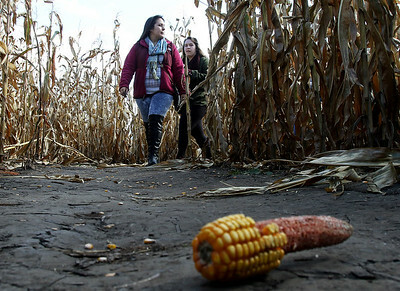 Matthew Apgar - mapgar@shawmedia.com Sisters Emily Guerra, left, and Caitlin Guerra, both of Chicago, find their way through a corn maze during the Autumn Drive event on Saturday, Oct. 17, 2015 at All Seasons Apple Orchard in Marengo. 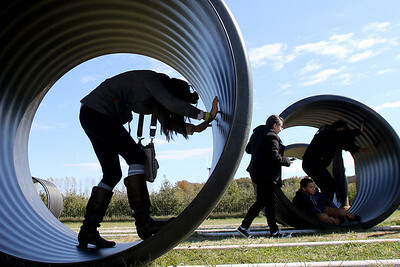 Aileen Escobar of Chicago, 14, left, rolls a large tube down its track during the Autumn Drive event on Saturday, Oct. 17, 2015 at All Seasons Apple Orchard in Marengo.